With Thailand set to witness both a lunar and solar eclipse this month, some local astrologers are warning the dual phenomena foreshadow more political chaos on the horizon for the kingdom. 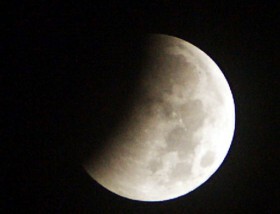 A total lunar eclipse was visible in Thailand last Sunday at 4:30 a.m., while a partial solar eclipse will take place on March 19 at 7 a.m. Astrologer Boonlert Pairin said that while a lunar eclipse relates to the fate of the people, a solar one concerns the government, and having both in the same month is not a good sign. He warned that political chaos and conflicts were in the cards for March and April.